Ladyface Alehouse & Brasserie celebrates its 4th Anniversary with a week of events in January.Sunday the 19th, all taps at the award-winning Agoura Hills brewpub begin pouring Ladyface ales and, over the course of the week, guests will be able to enjoy special releases, archived vintages, barrel-aged brews, collaborations, and casks. One of those special releases is Ladyface 4th Anniversary Ale, a Belgian dark strong ale. This year’s theme is Flores et Fructus, the traditional flowers and fruit offering for a 4th anniversary. Limited-edition 4th Anniversary glassware, with a year-long discount program, go on sale when Ladyface opens Monday, January 20th at 11:30am. Over the course of the week, there will be a Brewery Hangout with Brewermaster David Griffiths, a reservation-only Brewmaster’s Dinner, Barrel-Aged Beer Night, music and more. Event details can be found on the Ladyface Alehouse & Brasserie Facebook page and at www.ladyfaceale.com. And in other Ladyface news, Cyrena Nouzille, Ladyface Co-founder and General Manager has been elected to the Board of Directors of the national Brewers Association to serve a three-year term. The Brewers Association is a nonprofit trade association and is the largest organization of brewers in the United States with more than 1,900 brewery members and 38,000 American homebrewers. 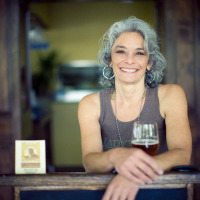 Nouzille, a resident of Agoura Hills and former Planning Commissioner for the city, currently serves on Brewers Association’s Brewpub Committee. Ladyface Ale Companie is also one of the founding members of the Los Angeles Brewers Guild and Nouzille will be serving on its 2014 Events Committee. Ladyface Ale Companie was established in late 2009 along with its restaurant Ladyface Alehouse & Brasserie. Named the Best Brewery an international RateBeer.com Best Brewpub in 2011 and 2012, and LA Weekly’s 2013 Best Brewery in LA, Ladyface is known for their award-winning Belgian, French and American style ales. La Blonde, La Grisette, Blind Ambition Abbey Ale, Trois Filles Tripel, and seasonal ales such as La Trappistine® Belgian Strong Dark Ale, Bluebelly Barleywine and Dérailleur® Bière-de-Garde are brewed onsite. Ladyface is one of Los Angeles County’s first modern day microbreweries, and the first brewpub in the Conejo Valley. Visit www.ladyfaceale.com.